Almonds are members of the Rosaceae (rose) family, along with many other tree fruits such as peaches, apples, pears, plums, cherries, and apricots. Within the genus Prunus, almond is most closely related to the peach, and the two crops share the subgenus Amygdalus. Almond and related species are native to the Mediterranean climate region of the Middle East (Pakistan eastward to Syria and Turkey). The almond and its close relative, the peach, probably evolved from the same ancestral species in south-central Asia. Almonds were domesticated at least by 3000 BC, and perhaps much earlier since wild almonds have been unearthed in Greek archeological sites dating to 8000 BC. The almond was spread along the shores of the Mediterranean in northern Africa and southern Europe by Egyptians, Greeks, and Romans. It was brought to California in the 1700s by Spanish Padres who settled the Mission at Santa Barbara. Around the turn of the century, the industry started in California, due to development of superior cultivars in the late 1800s. Tariffs on almond imports were levied to protect the industry. 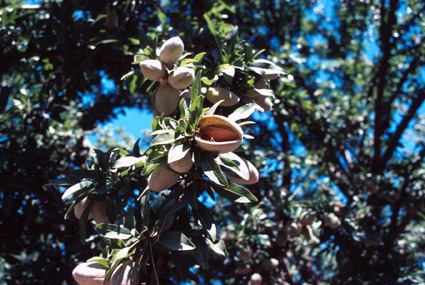 From then until about 1960, the industry grew at a moderate pace, but acreage and production have increased several-fold since then, making California the clear world leader in almond production. In 2002, there were over 500,000 acres of almonds in California, making it the most widely planted tree crop in the state. 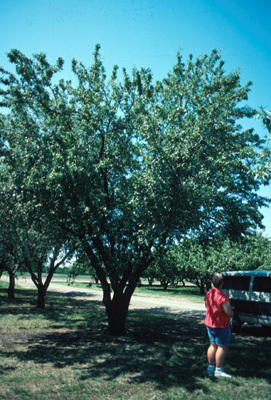 Small to medium sized tree with a spreading, open canopy, usually 10-15 feet in commercial orchards. Leaves 3-5″, linear or slightly ovate, about 3-4 times longer than wide, with acute tips and finely serrate margins. 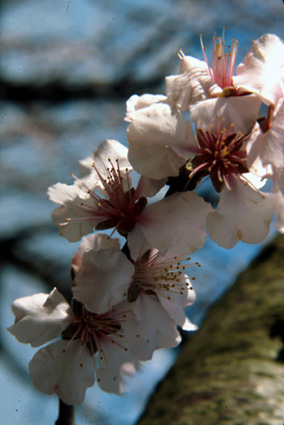 Almond flowers are nearly identical to peach and other Prunus flowers in structure, but light pink or white in color, and fragrant. Flowers have 5 petals and sepals, and many elongated stamens; the ovary is perigynous. Flowers are borne laterally on spurs or short lateral branches, or sometimes laterally on long shoots. Almonds are self-incompatible, and require cross pollination. Pollinators (honey bees) are absolutely essential, especially since cool, wet weather can occur at the relatively early blooming period. A nut. The entire fruit including the hull is a drupe; however, the hull dries and splits prior to harvest, revealing what appears to be the pit of the fruit. 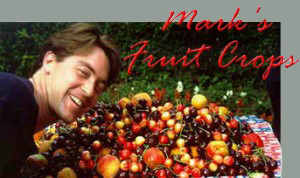 Fruiting begins in 3-4 yr old trees, with maximal production in 6-10 years. Unlike its short-lived cousin the peach, almond trees can produce for 50+ years. Thinning is unnecessary; a high proportion of flowers must set fruit for normal cropping. Requires mild winters, and long, rain-less, hot summers with low humidity. Almonds are budded onto seedling rootstocks. Peach seedlings (‘Lovell’, ‘Halford’, ‘Nemaguard’, ‘Nemared’) are the primary rootstocks for almond in the USA; almond seedlings are used in other parts of the world. Trees are planted in rectangular or hexagonal arrangements, with separate rows of pollinizers and main cultivars, usually alternating with each other. Solid rows of pollinizers are used since trees are shake harvested, and this makes it easier to harvest without mixing cultivars. Trees are trained to an open center shape in the first year. At maturity, pruning consists of watersprout removal, removal of dead and interfering branches, and limb thinning. The hull splits at maturity, and nuts physically separate from the tree at this point. Trees are harvested when hulls of fruit in the interior of the canopy are open, since these split last. The seed coat turns brown during the drying-out process of maturation. Delay in harvest increases risk of navel orangeworm infestation. In California, trees are harvested by mechanical tree shakers. Young trees may be damaged by shakers, so are harvested by hand knocking in the first few years. Nuts are then left to dry on the ground for 1-2 weeks, then swept into windrows for harvesting. Fruits may be dried and hulled immediately, or stockpiled for fumigation against Navel Orangeworm after harvest. Nuts are dried by forced hot air until their moisture content reaches 5-7%. Nuts are then dehulled and shelled. In-shell nuts can be stored in bins for weeks or months until final processing. Nuts are then shelled and sorted for size and appearance. Last, nuts are bleached for color improvement, then salted, roasted, and/or flavored before packaging. 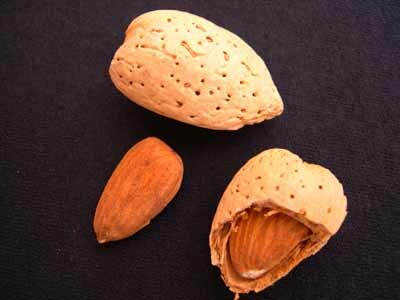 Almonds can be stored for months either in-shell or shelled if dry, or very long periods when frozen (years). Commercially, nuts for long-term storage are fumigated for navel orange worm and kept at temps below 40F. Almonds are the most widely-used nut for confectionery items like candy bars, cakes, toppings, etc. Much of the crop is roasted and flavored or salted and sold in cans; broken and small kernels go to confectionery. About 99% of almonds in the USA are shelled prior to sale, and 1% sold in-shell. Per capita consumption of almonds is 0.9 lbs/year, doubling over the last 25 years.